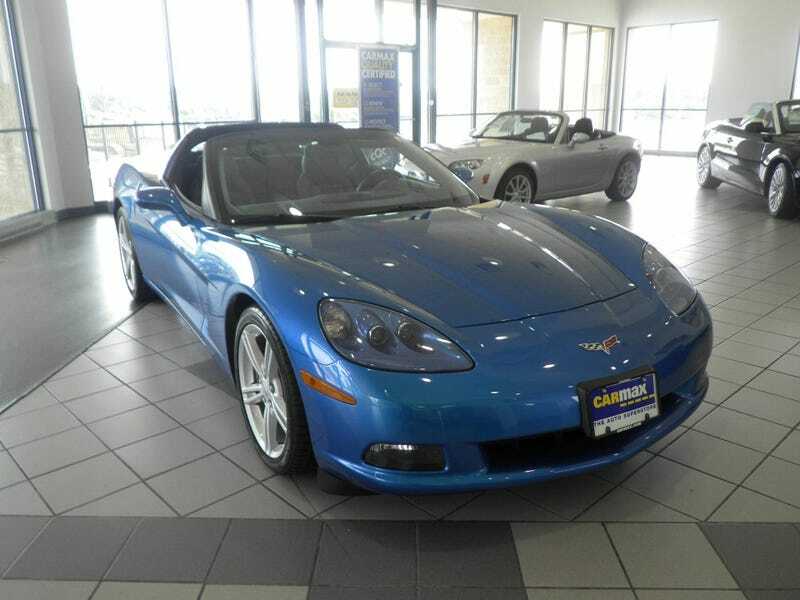 I went and drove this '08 Corvette at CarMax today. I actually rather liked it. It was mostly base, with the clear targa top (which I really like) and a Magnaflow exhaust, which sounded very nice. Compared to the C5 Z51 convertible I drove a while back, the interior is at least pretty decent. The sun visors on the C5 were way too big and in my face—they're still too big on the C6 but not as bad. The clear targa top is great, and driving with the top off is sufficiently airy feeling, although the view out the back isn't the greatest. The non-convertible car with the best view out the back shall remain the air-cooled 911 targa. Overall, the Corvette targa feels less claustrophobic than the convertible because there's no bulkhead right behind you. This car had the base suspension and it had some kinda not particularly aggressive Firestone Firehawk tires on it which combined for decent handling but the steering effort was a bit too light. The ride was downright cushy for a sports car. I'd probably go for a Z51. Power was more than enough. Whereas a C5 with 350 hp feels reasonably quick, the C6 LS3 feels properly fast. Shifting is better than the C5 as well. Better defined gates, and a shorter, smoother action in general. Pedals were well placed but my size 12 dress shoes would occasionally catch underneath the dash. I could heel-toe fine. Clutch was just about perfect. Overall, I liked the car a lot. This one had a color I like and the clear targa panel which, having tried it, is a must for me. If it were a Z51...well maybe I'd have pulled the trigger. But I have other cars I need to try. Alternatively, I could wait around for a while to let Grand Sports fall into my price range. I think that with the clear targa panel would be my top choice of Corvette.